Nothing is prettier at a summer picnic than a layered salad. This southern favorite not only looks great , but it tastes fresh and fabulous. 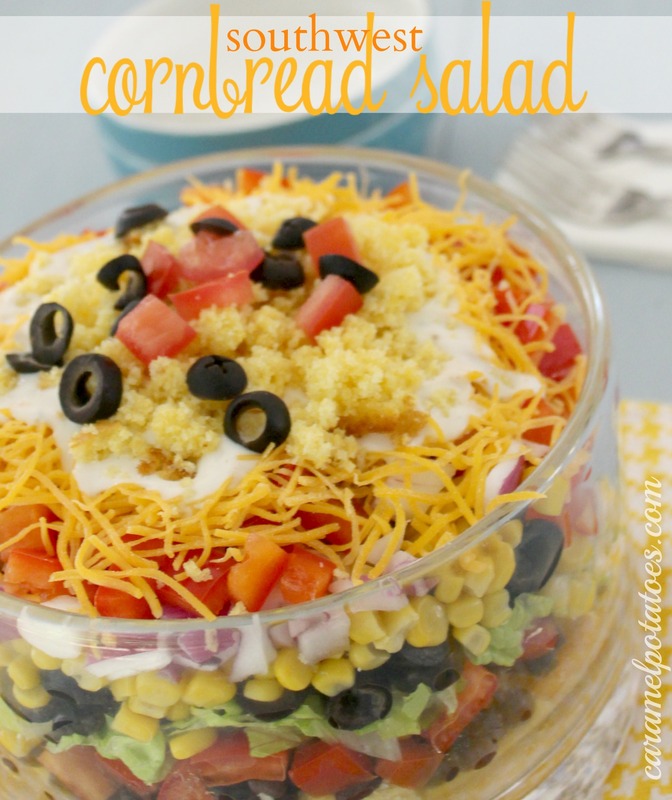 You’ll love the blend of lettuce, tomatoes, black beans, olives, corn, onions, and bell peppers combined with cheese and cornbread- Yum, that’s a lot of fresh taste going on! There is just nothing boring about this salad; and to make it more fun there are no rules to making it! Change up the layers according to your favs or what’s in your garden. To top off this fresh summer salad, I recommend our Chipotle Ranch Dressing or our Peppercorn Ranch Dressing. A homemade ranch will keep the fresh flavor of your salad. ; it’s easy to make and so worth the little extra effort. I promise, it will make all the difference in this salad. In a large clear bowl or trifle dish (2-3 quart) , layer half the pan of cornbread followed by black beans, tomatoes, and lettuce. Pour 1/2 cup of dressing over the center of the salad (Keep it in the center so it doesn’t run down the sides of the bowl). Continue layering olives, corn, onion, bell pepper, and cheese. Pour the remaining 1/2 cup of dressing on the center of the salad. Top with a layer of crumbled cornbread. (You may have some extra cornbread depending on the size of your bowl). Garnish with a few leftover tomatoes or veggies. Cover and refrigerate 1-2 hours before serving. Sounds so yummy and the perfect summer side dish. Thanks for sharing at Inspire Us Thursday at Organized 31.